In order to achieve a silouhette similar to that of the costume worn in the movie, I decided I'd need to wear a corset underneath the bodice. However, it should be noted that after speaking with someone at FIDM in 2005, it seems that the support structure of for the bodice (a.ka. corset) may actually be connected to the outer bodice and probably not a seperate garment as I have made it. 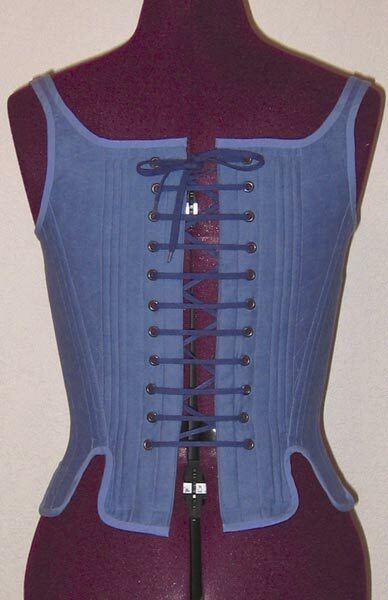 I used Wrights 7/8" wide bias tape in Thistle to encase the raw edges of the corset. I had quite some difficulty getting the bias tape to lay smoothly around the tight corners. I deviated from the Mantua Maker pattern slightly. I made the straps thinner (as is recommended in the Period Costumes for Stage and Screen book) and I did not bone the entire bodice. I left a few gaps and filled in with zig-zag stitches in order to lighten it up a bit. 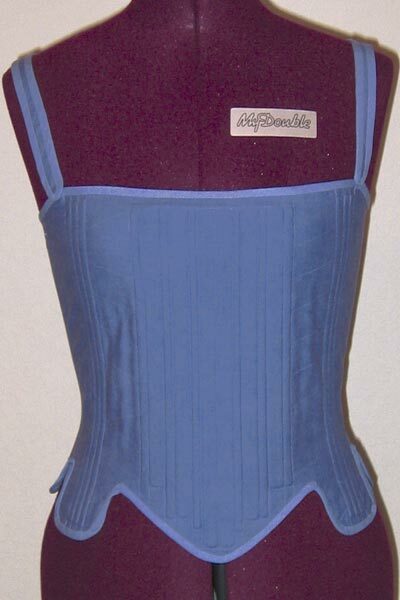 The straps were attached at the front using elastic, as is recommenced in the Period Costumes for Stage and Screen book. The busk in the front was omitted and substituted with 2 white coated spring steel stays (1/2" wide). Some sort of support is needed underneath the large skirt and heavy coat. 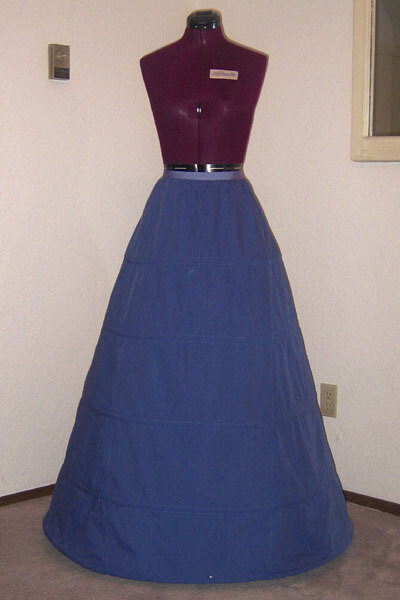 After visiting FIDM I learned that a farthingale is indeed worn underneath the skirt. It is made of a dark purple silk fabric that looked like satin. The channels of the farthingale were filled with something softer than steel boning. The 'wires' were collapsing and caving in under the weight of the dress. Perhaps something like nylon boning was used? 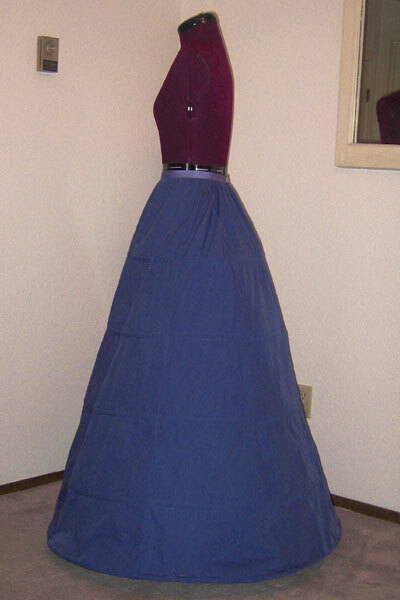 There isn't any kind of petticoat worn over the hoop skirt. The outer skirt rests diretly on top of it and I suppose since the hoop wires are so flimsy they don't show through to the outside of the garment. HOOPS: Plastic coated steel hoop wire. NOTES: The diameter of the farthingale is approx 3 ft wide (36 inches). I chose this pattern partly because it seemed to have the closest diameter to what I roughly calculated the Senate Dress in the movie has (an approximate diameter of 36"- based on enlarging a photograph to full scale size and measuring the width of the bottom of the skirt). It's not necessary to dye the farthingale, but I thought it would be fun and good practice before dyeing my velvet. After seeing the costume in person at FIDM, I believe the circumference of my farthingale is slightly smaller than that used for the costume worn in the movie. Perhaps this Simplicity #8881 farthigale pattern would have been closer in size. The weight of the velvet coat, and large velvet sleeves in the back of the dress tended to push my hoop skirt forward and upwards when I put the costume on. In order to counter act the weight in the back I sewed about one dozen lead drapery weights under the hem along the front of my hoop skirt.